We have FOUR new babies at Rosecrest Farm, and each arrival was a little different…. 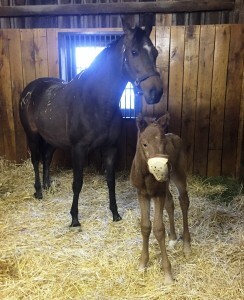 Yonehay and her brand new colt. Yonehay was very considerate and delivered February 20 at 10:15 PM, which allowed us to have a full night’s sleep. I said he had “long legs”. Maybe I should have said “long, long, long legs”! They were so long that he kept getting them tangled when trying to stand. For those of you who have never seen a foal stand up, let me try to explain. There are many miracles that occur with a birth, and one of them is standing. Foals seem to have an instinct to extend their front legs ahead of them, so they can push up with their backside. Then, with the front legs stretched, they attempt to balance of four wobbly legs. It’s My Lucky Day / Yonehay colt standing proud. Well this boy kept crossing those front legs, making it utterly impossible for him to stand. Chuck would uncross them, and then this young boy could stand. But the next time he got up, he wanted to cross them again. Sooooo through the night, he was very happy to have assistance from Chris (our nightwatchman) so he could stand and nurse. After 24 hours, he adapted to those long legs and is having NO trouble now, as you can see from this picture of him standing proud in the field! We were blessed with another foal on February 25, again at the decent hour of 10:05 PM. This mare, Truely Blessed, happened to deliver at the same time WC Racing’s Glen, part of the Rosecrest Team, arrived at the farm from California with his daughter, Macy. (Talk about timing… this was his first foaling to witness!) We put them both to work. Glen helped walk the mare to give her time to rearrange the foal into the correct position and Macy became the official photographer. Glen, Truely Blessed and Truely Blessed 17. Once in position, the foal made a speedy delivery to reveal herself to be a beautiful filly from the first crop of Tonalist. As you can see, filly and mare later thanked Glen for all his help. And maybe for the first time, there is a picture of me, the usual photographer, giving her a bottle of colostrum. Thanks, Macy! Lyra and Truely Blessed 17 getting her colostrum. Momma supervising! On March 4, Design for Life switched the norm. She delivered within ten days of the average gestation time (notice I’ve given up saying “due date” 🙂 ) and pushed delivery back to the middle of the night. Design for Life had been showing signs that she was getting ready to deliver for several days. Any of you reading this who have had a baby or been around a woman in those last couple of days prior to giving birth, may have seen behavior similar to that Design for Life was showing. She was very irritable, to the point of pacing and from time to time just hauling off and kicking the stall wall! Next to her, Diamond Stilettos did not like, but totally understood, her behavior. 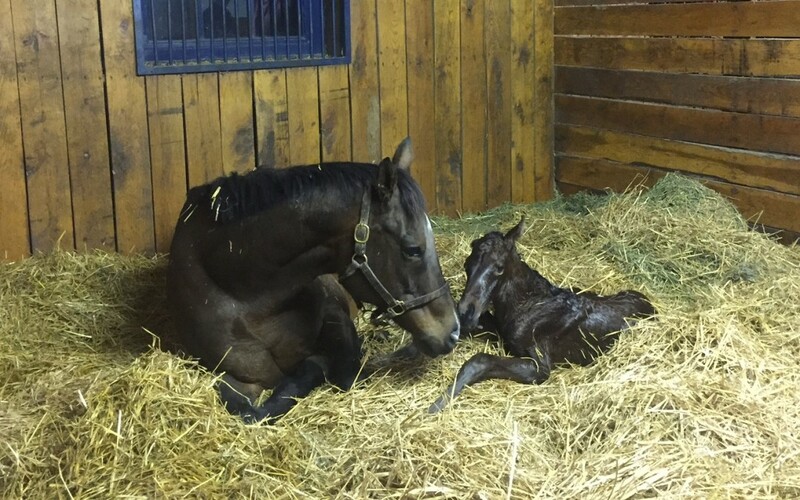 Luckily for everyone in the barn, Design for Life delivered a beautiful colt by Super Saver at 1:50 AM. He was very content to lay with mom for quite awhile before trying to stand. This was fine with us, because it gave us time to give him a bottle of colostrum while he was relaxed….which we needed to get done because he was not going to be allowed to nurse from his mama for a bit since he was at risk for neonatal isoerythrolysis (NI). I will try to briefly explain…. That is a mouthful of a term that literally means the destruction of a newborn foal’s red blood cells. If the foal’s bloodtype is incompatible with the mare’s antibodies, which are delivered via the mare’s “first milk” known as colostrum, it can be lethal. We take several precautions to prevent this. The first, and most important, is to test the mare’s blood during the last two to four weeks of gestation to help determine if she is at risk to deliver an NI-affected foal. If the test comes back NI-positive, we assume she will deliver a high-risk foal and plan for the second precaution, which is to have extra colostrum on hand to bottle feed the foal when born. The foal is most at risk the first day. After the foal’s intestines stop absorbing antibodies and after the mare’s regular milk comes in, it’s safe for him to drink her milk. That’s why you see Design for Life 17 with a muzzle on. Mama and foal are doing great and he is a “Super Saver”. Design for Life and baby not ready to nurse…. Next up was Get Back Anne, a first time mama who did not realize she was supposed to give us a few signs she was ready to deliver a foal. Nightwatchman Chris said she had a very normal night, eating and resting, so he was surprised when he heard her water break. 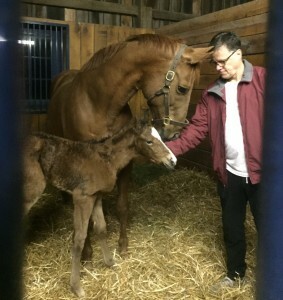 Chuck and I got there just in time to see her deliver a frisky filly by Goldencents at 4:35 AM. She tried to stand up in just five minutes and succeeded within 30 minutes. Just take a look at this video of how determined she was! 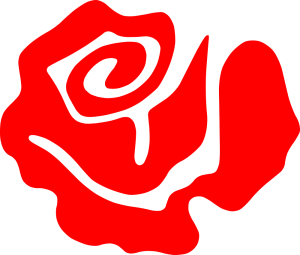 <iframe width=”560″ height=”315″ src=”https://www.youtube.com/embed/8XdUw3eY19c” frameborder=”0″ allowfullscreen></iframe> Or Click here if you have trouble with our “embedded” file. As I mentioned, this is Get Back Anne’s first foal and although she was very attentive, Mom missed the step when she was supposed to have colostrum and milk ready for the baby. So, again being prepared for this kind of thing, we got another unit of colostrum from the freezer, got it to feeding temp and bottlefed the filly. I think every member of the Rosecrest Team on the farm that day and the next took turns feeding. Just like any baby, they like to eat about every two hours. (Too bad Glen had already returned to California. We had a few guests at the B&B willing to help, but we did not press them into duty.) Luckily after several days, Get Back Anne was in full swing of being a Mom. Baby is very happy to exchange bottles for Momma. Here’s a video of Get Back Anne 17 going down for a nap… <iframe width=”560″ height=”315″ src=”https://www.youtube.com/embed/sQhqZSEaC-k” frameborder=”0″ allowfullscreen></iframe> Or, as before click here if our video doesn’t automatically come up for you. Saving the best part for last, I’ll tell you that Get Back Anne is named in honor of jockey Anne von Rosen, who was injured during a race in early 2014, prior to time to name this filly (now mare). WC Racing had winners in the past with Anne in Arizona and, to support Anne in her fight to overcome the injuries she suffered, named their filly “Get Back Anne”. You can read the Paulick Report’s story about Anne’s amazing battle if you CLICK HERE . This Goldencents filly is Get Back Anne’s first step on her new career, and it’s exciting to be part of WC Racing’s tribute to Anne von Rosen. What beautiful babies, wish I was there. Such an overload of cuteness and beautiful Mama horses. This was a special treat to see the videos too and interesting to learn about the colostrum. Thank you. Hope all is going well during this exciting but stressful at times I’m sure. LOVE these updates, even though they make me sad that I don’t live on a horse farm. Congrats on the beautiful babies. Love the babies!! I cannot wait to come and see them! !